Custom Heart Shaped Badge Reel w-Logo is made from recycled material. 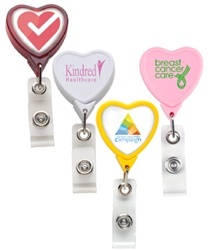 Promotional Heart Badge features stainless steel polished internal spring. Custom Heart Shaped Badge Reel w-Logo is available in 4 colors: Breast Cancer Pink, Cancer Awareness Yellow, Translucent Red, and White.